Damien Hirst is entrepreneur and art collector. He is the most prominent member of the group known as the Young British Artists, who dominated the art scene in Britain during the 1990s. No matter how many spot paintings there are on whatever, there will always be more words spilled over them. Always structured on the grid the works on canvas look as if they were generated by machine. 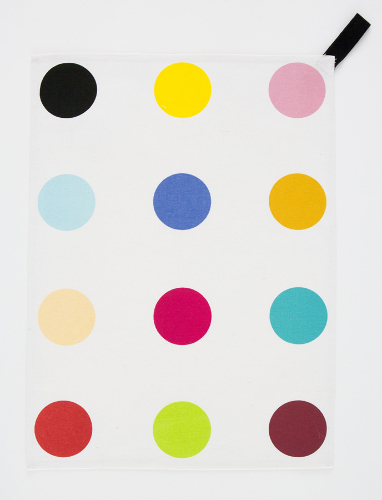 Here, indeed, dots are printed on a tea towel.